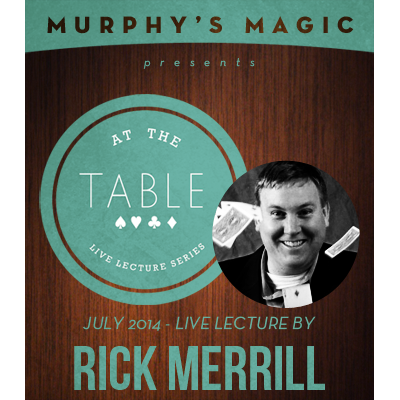 Rick Merrell: Rick is a FISM winning World Champion of Close-up magic. Join Rick as he shares with you what made him the champion that he is by sharing some of his visual magic and routines that made him so successful. His lecture is a show itself! From close up magic with cards and coins, to corporate magic, to comedy magic, there WILL be something here for everyone! Rick's Stand Up Opener: A multiple selection card routine filled with unique and entertaining revelations, original comedy, and great thinking. This is the routine Rick has used to open his stand up show for more than 10 years. It's filled with laughs and magical moments - and just wait until you see the method! Rick's Close Up Opener: After cutting his teeth in restaurants for more than 7 years, Rick tips his opening close up routine along with all his lines and gags. He also explains the psychology behind his patter and why it works for him. Three Change: A three coin routine where the coins change but do not "fly". Visual coin magic in Rick's off-beat style. Royal Cut Flush: An amazing display of card skill without the hours of practice. The method is almost as amazing as the effect! Coin and Marker: The basis for Rick's Grand Prix FISM act involves a sharpie marker and a Morgan silver dollar. With these two items, Rick will show you how you can perform mind-blowing magic that's both visual and entertaining! Sleeving: Rick shares his work on this useful and secret technique. Empty Hand Vanish: Learn how to vanish a pen, pencil, or marker - with your sleeves rolled up! Pure sneakiness! Plus Rick will share stories from FISM, his travels abroad, his feelings on magic competition, and useful thoughts on creating original magic! You're guaranteed to laugh and have a great time!